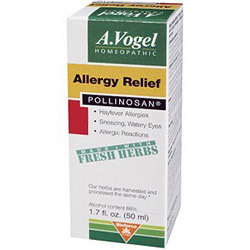 Allergy Relief, Also known as Pollinosan Exclusive formula containing Cardiospermum, the homeopathic alternative to steroidal anti-allergy medicines. Bioforce Allergy Relief – Natural Relief for Hayfever, allergies Frequent sneezing Itchy nose Nasal congestion Watery eyes Swollen eyelids Inflamed sinuses Dry, itchy skin Allergy eczema Dr. A. Vogel Allergy Relief is a specially formulated homeopathic medicine that relieves hay fever symptoms naturally. The natural ingredients act gently to stimulate your body’s healing power and build your resistance to irritants such as pollen, mold spores, household dust and other allergens. Clinical Study In a study performed in Europe over a two year period, over 88% of patients using Dr. A. Vogel Allergy Relief experienced relief from a wide range of allergy symptoms, including runny nose, sneezing, coughing, watery eyes, itchy eyes, sore throat, breathing difficulties and itching skin. DOSAGE Allergy Relief Liquid: 20 drops on the tongue or in a little water 3 times daily, 15 minutes before eating. Mix thoroughly with saliva and hold in the mouth for at least 1 minute before swallowing. Children: Half the adult dose and/or consult a doctor. Note: For hayfever, best results are achieved when the medication is started 1 to 2 weeks before the onset of the allergy season and continued throughout the allergy period. Special information In the first days of treatment there may be a worsening of symptoms, which fades away after a short time. This is a positive indication that the body is responding to the treatment and, in such cases the dosage should be reduced by half. This entry was posted on Friday, February 17th, 2006 at 1:10 am and is filed under Allergy Relief. You can follow any responses to this entry through the RSS 2.0 feed. You can leave a response, or trackback from your own site.